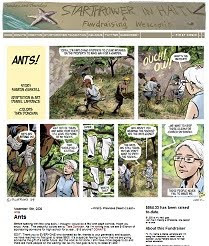 Recently I was invited to paint a web comic for Daniel Lafrance's blog, "Starthrower in Haiti", a fundraiser for The Starthrower Foundation which supports education in Haiti. It was a wonderful opportunity to put my digital painting skills to good use for a worthy cause. Click here to check out the blog and the story I coloured: "Ants!"